Middle offices are no longer a must-have function in banking. This is due to product and process standardization as well as automation among other reasons. In retail banking, middle offices are already nearly extinct. 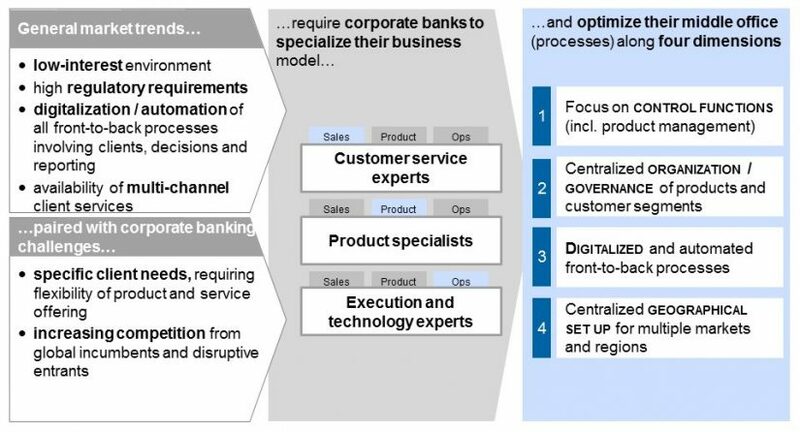 However, corporate banks concentrate many of their product and process competencies in their middle offices and could well use them to support the transformation towards a modern corporate bank. We introduce an alternative view on how middle offices could be kept for the better of the bank and its customers and how middle office managers could be seen as the pioneers of transformation. Middle offices have always enabled the relationship managers to focus on sales. A customer relationship manager would offer an individual solution to a customer, and the middle office staff member would set it up for contracting and processing in the back office. The benefit of this buffer between front and back office supported both stakeholders in achieving their goals, be it the revenue targets of the front office or the speed and cost targets of the back office. However, owing to the fact that middle offices come at a cost of their own, their added value has not remained unchallenged. In retail banking, with digitalization, regulatory standardization and the introduction of new workflows, it was possible to centralize the middle office activities in one geographical location. Simplification of the product offering process allowed banks in many cases to forego the middle office support. While they are nearly extinct in retail banking, a number of corporate banks still maintain middle offices. 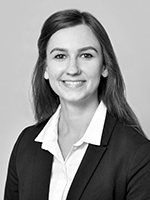 Their tasks include, among others, the handling of formalities, the product setup in the systems and the coordination of compliance and risk approvals. It seems, though, that nowadays even corporate banks tend to reduce the middle office support and implement simplified processes and automated workflows instead. In contrast to retail banking, however, corporate customers require more customized products and individualized solutions. Corporate middle office staff members, therefore, have to iron out more wrinkles before products are ready for customer use and the process then reaches the back office. Even so, taking into account the overall cost, middle offices are under pressure to meet their targets and will need to undergo changes. In our view, conventional middle offices will not be able to deliver the required service quality at existing prices in the future. Therefore, corporate middle offices need to change what they do rather than how they do it. 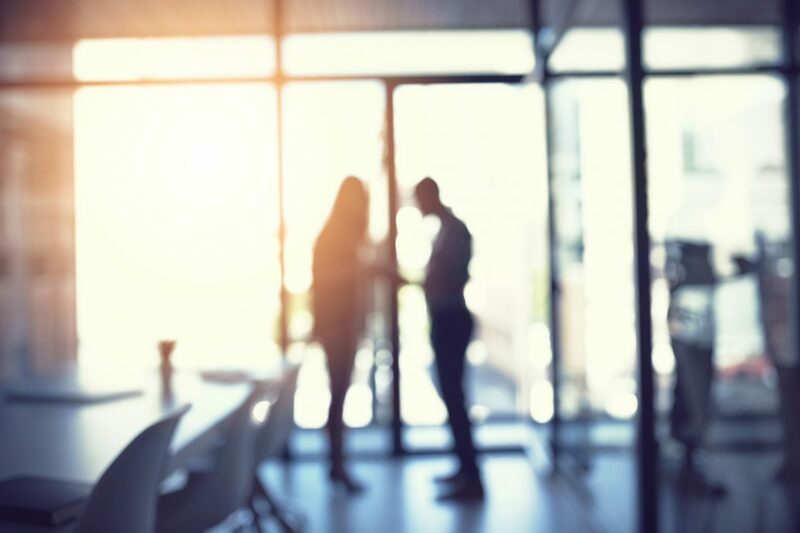 A look at the corporate banking landscape shows us that corporate middle offices need to reinvent themselves in order to meet the challenges of the overall banking market. The persisting unfavorable market environment in Europe coincides with the increasing corporate banking customer expectations. In addition, competition is growing, not only from the global players who have broad industry and product knowledge, but also from disruptive market entrants, such as fintech companies. We believe that the value proposition of the middle office within the company will have to be part of the DNA of the corporate bank in the market. Trying to differentiate themselves from their competitors, corporate banks will search for fields of expertise that they can excel in. There will be, for instance, experts for different industry sectors, such as the energy or building industries, or specialists for project finance, trade finance or treasury and cash management. Some will focus on small to medium-sized enterprises while others will mainly deal with large, international corporations. Customer service experts: This form of corporate bank acts as a direct interface to the customer. It supports the customer by selecting the most suitable products and services on the market, from within and beyond its own product range. Product specialists: These corporate banks focus on a special product group for which they provide expert knowledge and offer superior products and high-quality services. They may not always sell these products directly, but also by using platforms or agents. Execution and technology experts: These specialists provide system solutions, taking into account the special needs of different customer groups. They focus on technical interfaces, automation and digitalization of processes. In addition to its choice of a business model, the corporate bank should also consider the specific challenges in setting up its middle office. 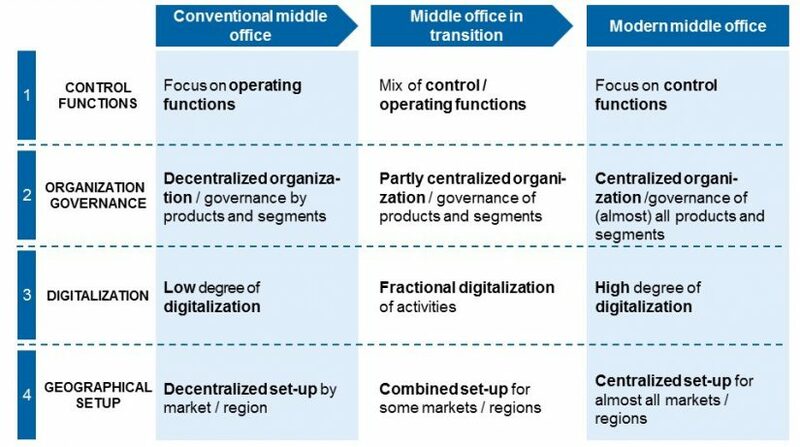 Whereas the conventional middle offices used to focus on operational support, modern middle offices concentrate on management activities. Formerly, middle offices supported the front-to-back process flow with individual, manual steps. The expectation of middle offices today, however, is that they standardize and automate these steps or even make them redundant. This can only be achieved by managing the individual process rather than by patching up its deficiencies case by case. Product and customer segment management is becoming more centralized. We expect to see less product differentiation promoted by the banks regional or branch offices. Instead, the centralized middle office assumes responsibility for product development, product placement, and for providing the operational support for its processing. Decisions regarding new product introductions or product eliminations are made at one central point. Products can still be adapted for specific customer needs locally, but these adaptations are made with predefined product components. Thereby, the process of setting up and maintaining the product in the back office remains fairly standardized. A similar approach is followed by customer segment management: strategic cornerstones are set centrally, but local tactical deviations are permitted. 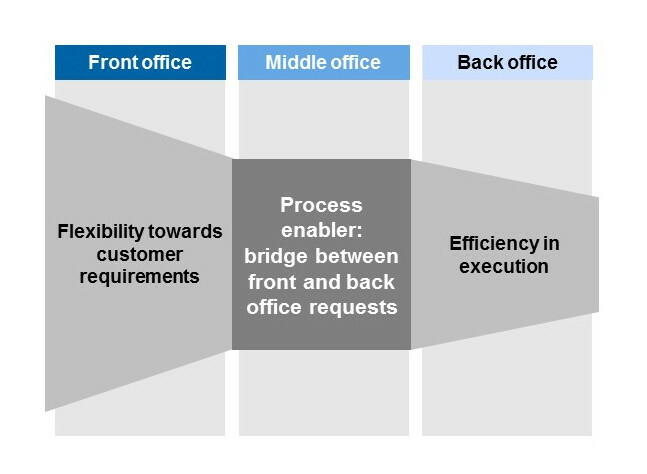 Front-to-back processes are becoming more standardized and automatized. A modern corporate middle office is a key driver of this trend. It is responsible for providing the technical environment to support processes and workflow-supported handovers in a streamlined process flow. We see middle offices as the drivers of service digitalization, and not only as a one-time effort. On the contrary, they should continuously translate business needs into requirements and ensure IT-support for these processes. Last but not least, these trends also come with a centralized geographical setup for multiple markets and regions. In the future, not every local outlet need maintain its own corporate middle office because the banks’ organization and processes are closely managed by the head office. Most corporate middle offices have already begun the transition towards a modern middle office. While some started by assigning one service center to several geographic regions, others meticulously worked on product management and the standardization of the underlying processes. We see both efforts as a support of the overall strategy of the corporate business, with the first example more suited for a customer service expert, who needs to cater for more flexibility in the front office, and the latter rather as support for the product specialist. We have observed these two transition paths with two of our clients, both national champions in their segments in two developed European markets. 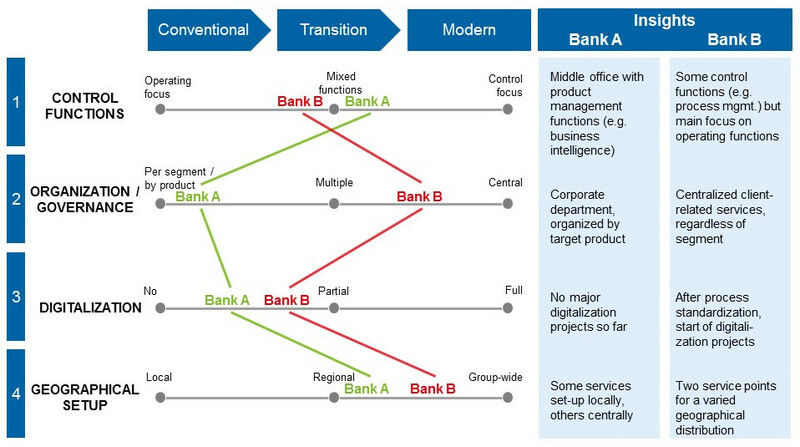 Bank A is a German product specialist, whereas Bank B is a Swiss universal player who pursues a mainly service-oriented strategy for corporates. During the course of modernization, Bank A selected a couple of its core product offerings, standardized them and trained the staff of its local outlets in the services associated with these products. Some of these services remained local, whereas those requiring sophisticated product expertise became centralized. This model has already enabled the bank to optimize the front-to-back process without moving into digitalization, yet. Bank B followed a different approach. Their middle office focuses on providing services for the front office and to the customer, in those matters that are identical for all segments. These initially included compliance-driven processes and standard products. Now, the processes in the front office are harmonized to such a degree that the middle office can feed in their standard service at any time, therefore relieving the front office of all interfacing work. The bank is especially interested in the potential of standard process digitalization from which it expects major reductions in operating cost. The challenge they are facing, though, is that there are no one-size-fits-all solutions for corporate banking. A middle office-like activity cannot fully disappear from the overall functional landscape in the near future, since full automation is not within reach for most banks. Cracks in the front-to-back process will persist in some form, but this is a thin lifeline for the middle offices. We expect middle office managers to actively contribute to the reduction of the requirement for their operational services. They should use their knowledge of products and processes to help the transformation towards a modern corporate bank. This is the only way for them to justify their seat among the decision-makers.